Call now for your best price (647) 717-1127! The maintenance and cleaning of the eavestrough are something that needs to be done regularly as part of the house maintenance process. This job depending upon the trees nearby and climate needs to be undertaken either biannually or annually. Though, working with a professional will make the job easier, convenient and saves you the headache of completing the job on time and risk of injuries it involves, a considerable amount is required. Here are some factors that determine the pricing involved in the cleaning of eavestrough. 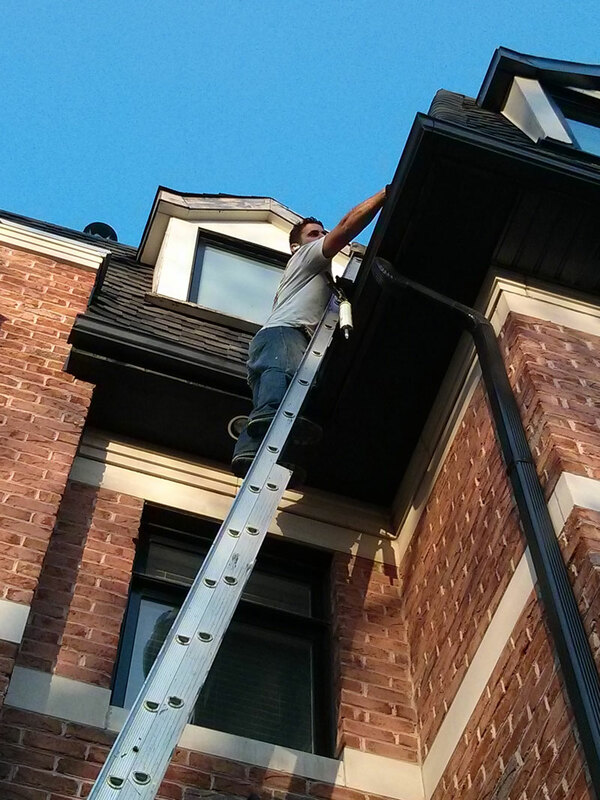 The cost to clean eavestrough varies from city to city depending on the cleaning interval. Eavestrough regularly cleaned would cost low compared to eavestroughs in buildings that involve extra risk for its cleaning. The height of your house is an important factor to determine the price of the cleaning service. Cleaning of eavestrough on a one or two storied building is generally done with a ladder and hence will involve low cleaning costs. The cost increases with each story. Cleaning and maintenance of eavestrough in tall buildings requires special lift and other safety equipment for technicians, therefore rise in cost. The cost to clean the eavestrough usually is determined by the amount of the linear feet of the eavestrough or the square footage of the house. The larger the house, the more the cleaning expenses. A single storied home have typically low pitched roofs with eavestrough systems that cost minimal. If you have not got your eavestroughs cleaned for quite some time then the cost to clean them will go higher. If there are lot of debris to be removed, the job may take a lot of time. The extra time involved may determine the cost. 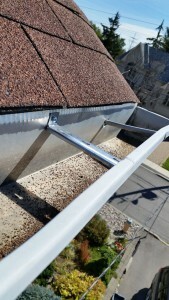 Like all the other outdoor maintenance ventures, frequently cleaned eavestrough leads to faster, quicker and simpler completion of the process. Handymen usually surcharge for cleaning excessive and intensive amount of debris like leaves and other material. If the eavestrough is damaged or not in proper working condition due to its non-maintenance over time, this may require the handyman to dedicate some extra time and equipment to resolve jams and appropriately repair them. This may lead to excess service and other charges, extending your cleaning budget. There are chances that you may avail extra discounts while signing up for the repeated services with the same contractor or while you contact handyman during his off season. You may hence save on the eavestrough cleaning costs. It is always ideal to contact two to three professional, compare their rates, work history, trustworthiness and then decide hiring on the right person for the job. You need to always find someone whom you can trust and rely on to take the job forward. Getting the eavestrough and gutters cleaned at regular intervals may save you lots of money over time. It, however, becomes essential that you make sure that the eavestroughs are cleaned so that your yard is not flooded and the foundation of your building is not damaged. Regular maintenance keeps the eavestrough clear and secure, decreasing all the risks to your home. The main purpose of cleaning your eavestrough and gutters is to see that the rainwater is off your roof and goes away from your house. It helps in avoiding stagnation of water around the house and minimizes damage to the building structure. However, blockage of water may lead to rusting of eaves troughs and the roof leaking. Hence a quick, virtual, practical approach in clearing and maintaining your eavestroughs may help solve all your drain problems. 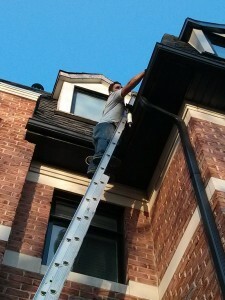 There are various ways of cleaning the eavestrough. While some clogged ones may require sophisticated tools to handle, many of them can be done with simple available material at home. Some rubber gloves, garden hose, power sprayer and a ladder would help in the cleaning process. You can always use a trowel to scoop and scrape the debris found out of the eavestrough. You need to take the support of a ladder as you are working on the roof. It would be of great help to shift ladder from one side to another than trying to reach an itch in a body cast. Safety measures should always come first. You can make use of a hand glove and remove small sticks and leaves that would go down inside and block up the eavestrough. The cleaning process if done at regular intervals will not be a difficult task. However, purchasing gutter toppers or eavestrough screens would be very helpful. It may give you less work in the long run. The cleaning applicator is usually shaped to fit perfectly into the end of any painter’s pole. It very easily wipes away dirt and grime that accumulates over time. The eaves trough is mostly filled with twigs and dry leaves that can be removed using a vacuum accessory. The material found inside the eavestrough is sometimes heavy and wet. In such a scenario the tongs, in a simple way grasp the debris and lift it out. Many handyman use the power sprayer to blast away the clogs. This makes the cleaning process really effortless and uncomplicated. Cleaning of the eaves is no big deal if done using the right expertise and accessories. However, the process of cleaning the eaves become important as it is essential to keep your house trouble free, presentable and beautiful. Regular cleaning of the gutters and eavestrough saves you time, energy and you can relax without much work to do. Picking up the right tool to help you do the cleaning will give you the confidence to do it again and again. Everything said and done, it is recommendable that a professional is a better option to doing all the chores in a much effective, efficient and proficient way. Solid Eavestrough – Gutter cleaning is an important part of maintaining and caring for your house. If you have not had the gutters cleaned, it is perhaps a wakeup call for you in order to avoid major problems in the future. Here are some benefits listed in order to get your gutters cleaned and maintained at regular intervals. The main purpose of your gutter is to gather water and remove it from the house. Water when accumulates on your roof needs to go somewhere. Gutters are designed accordingly to force water off the roof. When the gutters are clogged they are unable to perform this function and as a result water accumulates. This can turn harmful to the structure of the house and the pooled water may lead to leaky roof. There are various health benefits associated in having your gutters cleaned at regular intervals. A leaky roof usually leads to moisture inside and accumulation of mold and mildew. This may be extremely harmful to the family’s health and result in several respiratory ailments. Cleaning the gutters eventually protects the health of your loved ones. In the long run if the gutters are left clogged and blocked you may need to replace the entire roof of the house which may be an expensive affair. Hiring a professional handyman to clean the gutters is cost effective while compared to the replacement of the whole gutter system or the roof. Stagnant water invites mosquitoes and other insects which breed and spread dangerous health diseases. Besides, moisture and wetness leads to cockroaches and termites which may be harmful. Your clean gutters are the key to your good health. The water accumulated at the roof may leak down the walls of the building, sinking into its foundation and damage it. The foundation or the base of the house determines the strength of the house. If the foundation is damaged, the house goes weak and may diminish its strength in the long run. A leaky roof, moist walls and flaunting insects doesn’t portray your house in a good way. A cleaned gutter may help you present a lovely house. Gutters cleaned at regular intervals may help you present a clean and picture perfect house. Water that accumulates due to gutter clogs causes moisture damage to the wooden interiors and the fascia around the house. If the leaks on the roof are undetected it may also lead to damage to the walls and ceilings. Hence, you end up renovating each and every aspect of the house from furniture to the foundation. The beauty and value of your house depends on your gutters. If the gutters are full of debris and leaves they become heavy. If water overflows, it leaks behind the gutter and makes way into your house. 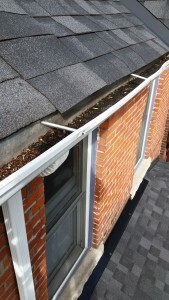 Hence, gutter plays a key role in the protection of your house and needs proper maintenance and protection. One of the most common problem’s homeowners face is keeping their gutters cleaned, and depending on a number of different factors this can be quite a chore. If you find yourself in the position of constantly worrying about leafs in your gutters, then use some of these leaf gutter protection tips to help minimize the problem in the future. Do you live in area with a lot of trees? Have your neighbors suddenly got the urge to create a new forest in their backyard? Knowing these kinds of things is going to be a big part of deciding what you need to do to reduce the leafs in your gutter. So if you can’t immediately identify the source of almost all the leafs, and other debris getting caught in your gutter, then take a walk around your neighborhood to identify the culprits. Having this information on hand will play a big part in deciding how much money you need to spend, if any on leaf gutter protection. It’s a good bet you regularly keep an eye on the weather, but do you ever think about what potential side effects it might have beyond the obvious? Thunderstorms are a perfect mix of rain, and wind the two key ingredients in clogging a gutter. So the next time you’re watching the weather, pay special attention to how fast the wind is supposed to be blowing. A strong wind can blow in leafs from miles around, and this means you might need to give your gutters some extra cleaning. If you have a lot of trees on your property, then you might want to consider hiring someone to do some tree trimming. The price is often surprisingly affordable, and it can go a long way to reducing the need to clean your gutter regularly. If you’re on a tight budget, then it might be easier to have the one or two trees that are the biggest contributors of leafs trimmed instead of all of them. A longer-term solution for gutter protection is to install one of the products out there designed to stop it completely. A Good quality gutter system is placed over your gutters that allow rain water in, but keep leaves out. This can be a big investment for some people, but that should be balanced against all the potential time saved in the future for not having to clean your gutters. If you can’t justify spending money on tree trimming, or installing any special protection for your gutters, then there remains one time-tested method. Cleaning your gutters monthly will make sure they don’t have time to become filled with leafs, and thus turning a yearly cleaning into a major event. 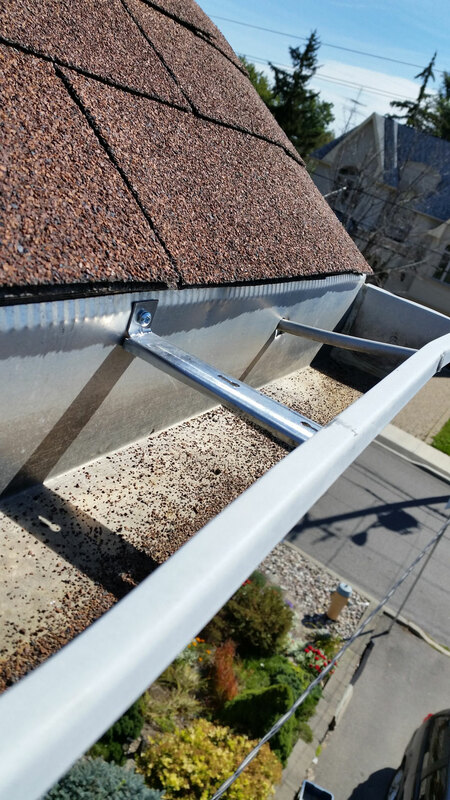 The truth is keeping your gutters clean, and running smoothly is something that anyone can do by following just a few basic tips, and now you know them.